Any further exclusions can then be added using the 365 portal by setting the customattribute1 field to the value exclude. 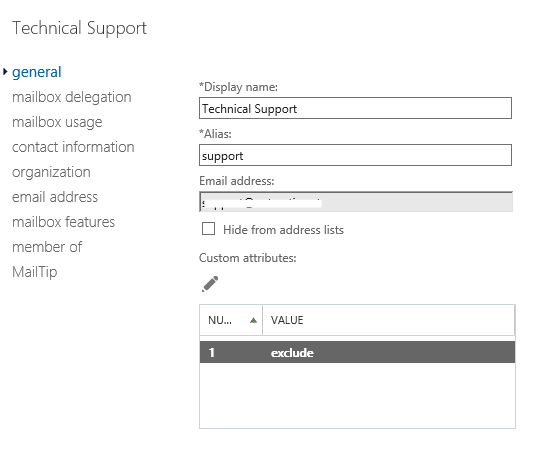 Unfortunately setting custom attributes is not possible if you are using Azure Sync and never had a local Exchange server installed to extend the AD schema. I am in this camp, but I did extend the AD schema with Exchange attributes… just download an eval copy of Exchange Server and run Setup /PrepareSchema. I use Exchange custom attributes flawlessly. NOTE: you DO have to update the Azure AD Connect schema afterwards by running the configuration again and choosing the update schema option or it won’t work. I also use 365 Command AD extensions to add O365 specific tabs in Active Directory Users and Computers (http://365command.com/support/active-directory-extensions/overview/). When I am excluding a user from the everyone DDG, do I type the exclusion as their displayed name or actual account name? For example, “-and (-not(name -like ‘steven’” is ‘steve’ the display name of the user to be excluded or would it need to be the actual full account, for example, steve@steve.com? I was getting syntax errors with the above command. I had to change the single quotes around ‘exclude’ to double quotes “exclude”. If you copy/paste you get “open” and “close” single quote rather than the plain single quote from your keyboard. It had me head scratching for a while until I remembered the seeing the behaviour before.